In the summer of 1941 in the premises of medical school on the Kiev highway, the Nazy occupiers arranged for Soviet prisoners the so-called «hospital». In fact, it was unlikely, that someone could be treated in this institution: there were any conditions to defeat the sick and wounded ones from the Red Army, systematically. Quote: «… 30 degrees frost. The hospital is not heated, it is equipped primitively, it is crowded to the full, patients are lying in heaps anywhere, even all lanes are occupied, and there are arriving thousands of the wounded, an acute shortage of medicines, the care is awful … we eat soup, made of raw meat and potatoes without fat and boiled rye…» It’s General Lukin, the commander of the 16th and 20th Army, the hero of the Smolensk and Vyazemsky battles, in his honor was named one of the streets of the city (during the Smolensk battle, the General led the troops courageously, thou they were surrounded, near Smolensk, and in such way he diverted considerable forces of German troops from the Moscow attack, he was captured not far from Vyazma, after being seriously wounded, the Germans amputated his leg and as a result he remained paralyzed. After the end of hostilities he returned to his Motherland and — by the personal orders of Stalin — was not exposed to reprisals. Mikhail Fedorovich Lukin got back his Orders and was restored in rank). The only medical procedure which was done here – was the forcing collecting of blood from the wounded. And not 200 grams, but a liter per a person. The mortality rate was 200 people per day. Just throw the «hospital» pervaded to 100 thousand sick and wounded Red Army members. About thirty thousand of them died. The dead were buried in mass graves, located in the hospital territory and to the east of it. 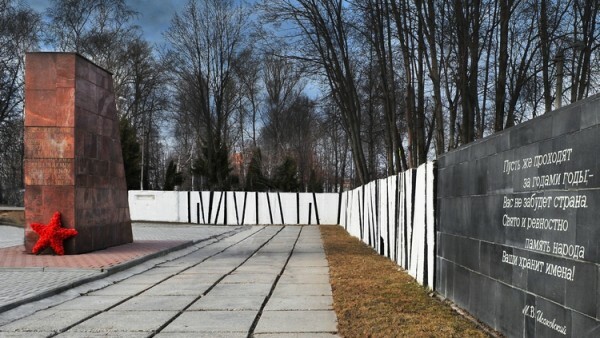 In 1977, at the burial site (M. Konev driveway, park) was built a memorial complex, which is the object of cultural heritage (the monument of history and culture) of regional importance «Mass graves 30,000 Soviet prisoners of war who died in hospital in 1941 — 1943.».